As noted here before, it's been a cool, wet spring in the Sierra. Snow, rain, and not enough sun to melt the snow off the trails. So we decided to go backpacking anyway. First choice was in Desolation Wilderness...so we got our permit weeks ago. And realized there was no way we were hiking in that snow. Then we thought about Carson-Iceberg Wildnerness of 108. Both Arnot Creek and Disaster Creek sounded vaguely possible until a few days before our department. They both entered the snowline with a mile or two of the trailhead. And that's when we thought about Lost Lake, Sword Lake, and Spicer Reservoir. The top elevation would only be about 6700 feet, and snowline was just about that. How bad could it be? Or how good? Well...we started from the Wheat's Meadow trailhead, and we had the place to ourselves. Admittedly, day one was a bit of problem. Threatening weather and poor trail conditions made this the longest five miles we've ever hiked. The first two miles were a simple climb up and down a ridge. But that was followed by two miles (and more than two hours) of wandering up the Dardanelles Creek watershed in the snow. The trail was either under snow or under water, but we managed to navigate with map, compass, and a lot of stopping and looking around. 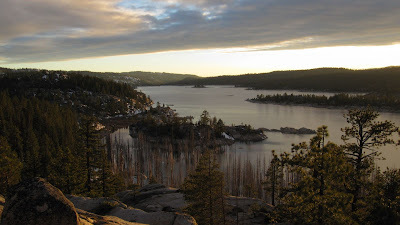 The last mile was a piece of cake/ Once at the lakes, we got amazing views--we camped on the western rim of Lost Lake, and admired the views of Spicer, the Dardanelles, and the rest of this part of the Sierra. Definitely one to keep in the back of your mind. And a great start to the summer!